Our partner for Phase 1 of the Rail Park, Center City District, recently shared an update on the site construction. We were thrilled to hear about all the latest progress, so we wanted to share it with you, too. And here’s a spoiler: the best news is that everything is on track for completion in early 2018! Mild temperatures this winter enabled our construction team to complete all demolition and site clearance by the end of February. In March, the masonry north wall and underpasses were thoroughly cleaned to allow for repointing and repairs. Portions of the masonry on the perimeter walls are being repositioned, including resetting the top coping stones which were displaced by years of plant growth in the wall joints. Steel elements on the trestle structure continue to be cleaned in preparation for upcoming welding repairs, painting and undercoating. Steel on the underside of the structure has been sandblasted and is now being treated with rust-proof coatings. 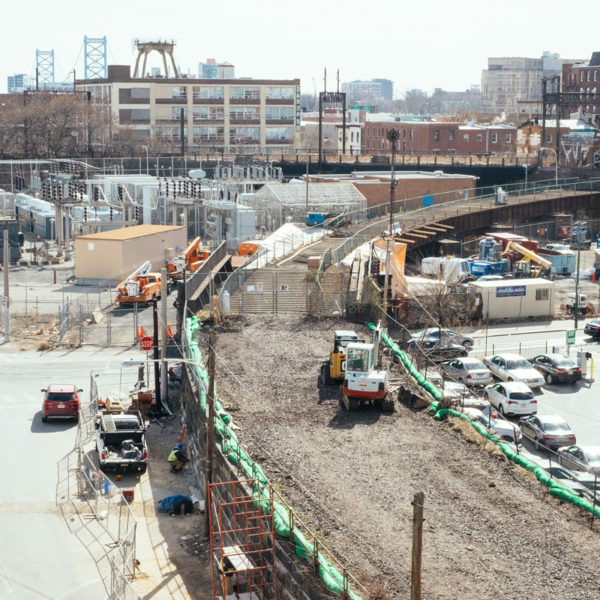 On April 11, the large I beam, damaged by repeated collisions, on the east side of the Callowhill Bridge was removed and a new I beam will be fabricated to support the overpass and the park’s many improvements. All the hardwoods and other materials for benches, railings and stair have been ordered and will be installed this summer. A variety of shrubs, trees, and flowering plants will be brought to the site in early June and planting will continue into the fall. The project is still on course to be completed in January 2018. That’s the latest from Center City District, but we’ll keep you updated as more progress is made. Want to see the Rail Park in person? Join Friends of the Rail Park board members for a street-level walking tour of Philadelphia’s next great public space. The tour begins at the corner of 21st and Pennsylvania Ave., on the east side of the Rodin Museum. Then it extends about 1.5 miles along elevated and submerged sections of the former Reading Railroad, all the way to the construction site of Phase 1 at 12th and Noble Streets. Join us! Spend a Spring morning hearing stories about the Rail Park’s history and visions for its future. Just make sure you wear good walking shoes. To support the ongoing growth of the Rail Park, we’re throwing a party at the brand new Roy Pitz Barrel House in Philadelphia. We want you to join us. Things will get started at 6 pm, with a VIP Cocktail Party—featuring craft cocktails, barrel-aged beer, light fare, and live entertainment. Then, at 8 pm, we’ll transition to a more casual after party, with a DJ and cash bar.